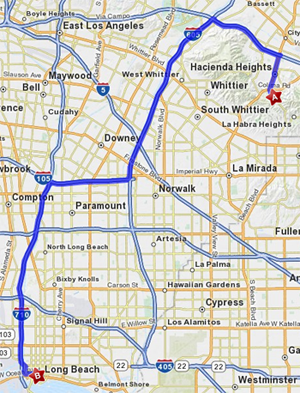 IMPORTANT NOTE: THE WEEKEND OF THE WEDDING, THE 405 FREEWAY WILL BE CLOSED BETWEEN THE 101 AND THE 10. FOR ROAD CLOSURE DETAILS, CLICK HERE. PLEASE GIVE YOURSELF AN EXTRA HOUR TO GO ANYWHERE IN LOS ANGELES COUNTY, AS ALTERNATE ROUTES WILL PROBABLY BE JAMMED. To minimize your travel, we suggest staying in Long Beach. The drive to and from the temple shouldn’t be too congested on a weekend, but it’s still about 40 minutes, so be sure to build in some time. If you get lucky, you may find street parking, but Saturday nights are crowded, so your best bet is parking at your hotel or using the valet parking at The Madison. We’ve put up a message board so you can set up carpools. If you’re an out-of-towner in the wedding party and need a ride, don’t worry. We’ll be renting a minivan so you can cruise to and from the ceremony in true Mommy-Mover style. © 2019 Rachel and Cormac.